We love our customers! So, in order to reward our loyal customers who visiting Capt Hirams, we present the Capt Hirams Loyalty Rewards Card. This card enables you to earn back cash for having a good time at Capt Hirams Resort! Pick up your card from your bartender or server during your next visit and start earning immediately. Be sure you register your card, so that we can track your points and send you a special deal each month-- only for our Loyalty Club Members. Scroll down to the form on this page. Complete it and you will be all set! Drink Points – for each $1 spent on any beverage purchase, alcohol or non-alcohol, 1 point is earned on the card. When point value reaches 625, $25 will be added to your card and can be used as a gift card towards your next purchase. And remember: Capt Hiram's Loyalty Rewards Card holders get Happy Hour Drink Specials extended to 3PM - 6PM on Saturdays and Sundays, TOO! Pretty simple. 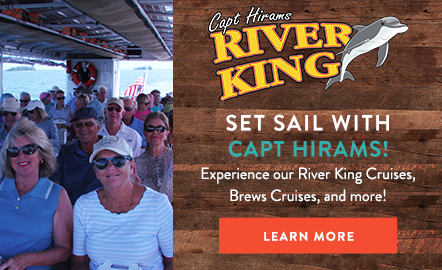 Show your Capt Hiram's Loyalty Rewards Card upon checkout and we’ll take 10% off your entire purchase! *Not combined with any other special pricing at time of check-in or when booking online.